Series III Gearshift Lever Nylon Bushing Failure Repair. Hi there. I searched the net tonight, because my Landy got stuck in reverse. After serious jerking, I managed to get it stuck in 4th and drive home between low range and low range + over drive. In my searches, I stumbled across your e mail address. I am a South African missionary in Uganda. I drive a SIII 109, with 2,23L petrol engine and it has an overdrive. I am a bit of a noob with Land Rovers since this is my first one. If the gear lever feels like it it falling around loosely, and it does not want to change into any other gears, what could be wrong and what can I do to fix it? The clutch is fine. 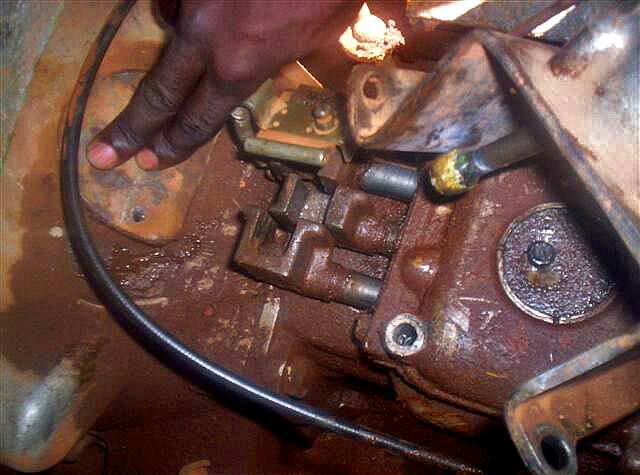 I don't trust Ugandan mechanics much so I just want to find out what is wrong before I take it to them or maybe I can fix it myself? Anyhow. Any help or advice will be welcome! I have had the same symptoms on my Series III 109. 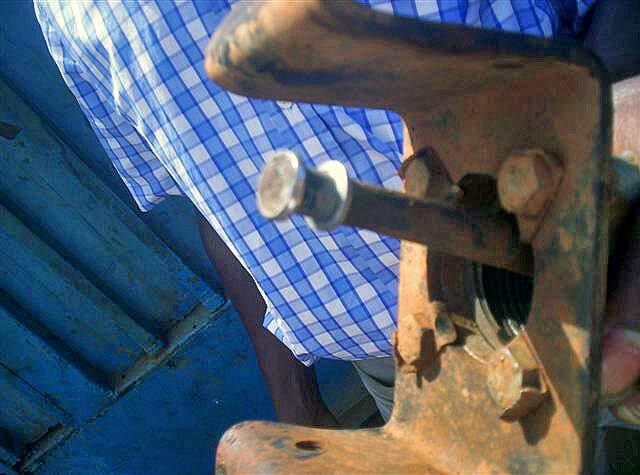 The gear shift lever suddenly felt loose and it could become stuck between gears and very hard to get out. 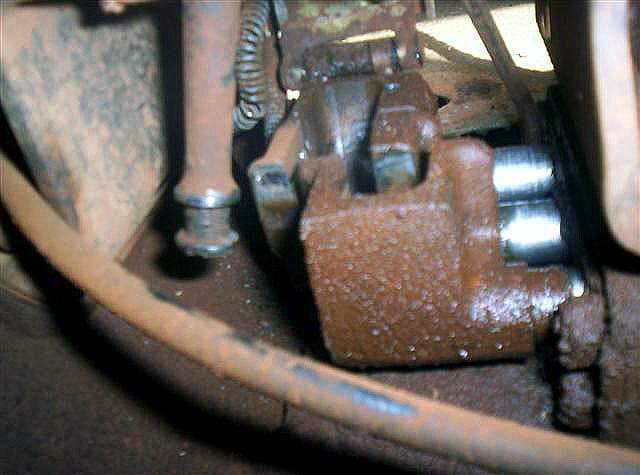 In my case the problem was a bushing at the end of the shift lever had disintegrated. It is a cylindrical nylon bushing that fits in a groove at the tip of the lever. When it disintegrates, the tip is maybe half it's normal size and then it flops around and can get stuck between the shift levers. The bushing is not replaceable. You could replace the shift lever, or do what I did. I pulled the lever, and found a big nut that when measured across the flats fit within the selector fork grooves with room for play. Then I got a die the same size and thread as the nut and cut threads on the end of the shift rod so that I could thread the nut onto the end. 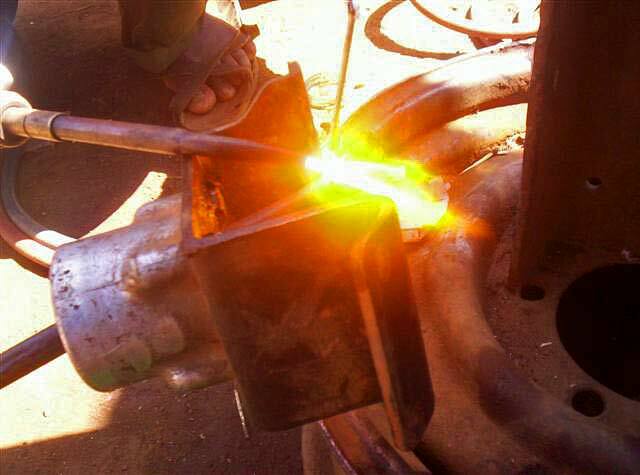 Once that was done I brazed the nut in place - welding would do the trick too. Lastly I ground down the corners of the nut so that it was fairly round and fit in the selector fork grooves with enough play. Bolt it down and make sure you can shift into all gears easily before putting the tunnel cover back on (you need to pull the floor panels and tunnel cover to do this). Good luck, and let me know how you made out. Wow. That was fast. It is definitely a good starting point. The previous owner was a fanatic and he gave me a box full of manuals, part lists and spares. 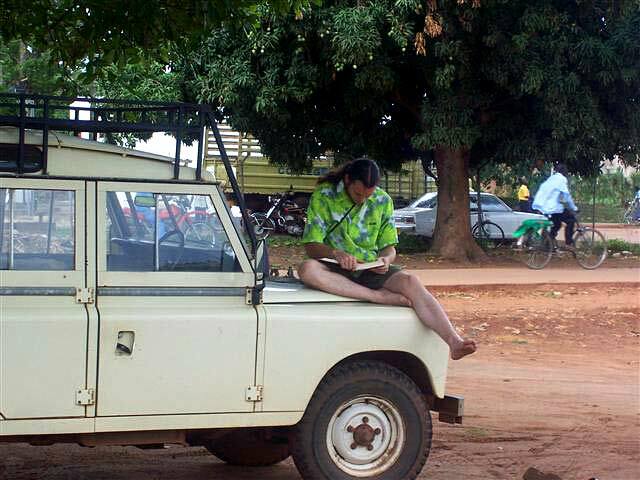 I think chances are small to get another lever, but there is a guy in Kampala with a Land Rover graveyard if you can call it that. They also use the short wheel base series III over here for breakdowns. I will let you know what the outcome was and maybe take a few photos of the process. This is really the first thing I had a problem with except changing a light bulb in the last year! Greetings from Uganda and thanks. You mentioned a boneyard - see if they have any earlier Series IIAs. 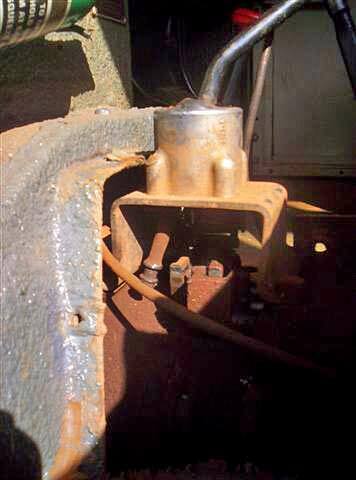 Although some of the late IIAs have that stupid bushing, the earlier shift levers have a metal (brass?) ball on the end with a groove around it to fit an O-Ring to keep it from rattling (for a little while til the O-Ring breaks). The best levers I think are the ones that are not straight, I think they are bent at 2 angles. They seem to feel and fit you the best. Get one with a knob as the SIII knob will not fit it. Whichever way you go coat the ball and the selector fork grooves with grease to keep it working smoothly and to keep it from rusting. Change the oil in that Overdrive regularly (at least as often as the motor oil) as they are very expensive to replace now. Oh, and don't use it in any other than 2wd High. Some of the needle bearings in them are about as thick as a pencil lead and they don't take well to high torque pulling abuse when engaged, despite what the manual says. When the gear lever got stuck yesterday, I was worried because I heard stories with a lot of $$$ attached to them when it comes to Land rover and gearboxes. After reading through the transmission part of all my workshop manuals and the owners manual and all the troubleshooting sections, I could not find anything like a gear lever that is stuck and being stuck in one gear etc.. I design websites to generate some income on the sideline, and resort to the Internet for many things in life. I searched and ended up on many different Land Rover websites. Nobody had the same problem as me. I then searched for transmissions and gearboxes and then your name popped up in an article. Your e mail was written there at the article, with some spam preventing characters etc. That is how I contacted you. I must tell you that I know there is definitely Divine intervention involved in the whole thing! Why, of all people on the planet and the Internet, would I end up asking you about a problem and you end up having the same Land Rover as me and know exactly what to do!? I must be honest that I did pray and ask God that He must really help me because I can't find a solution and I am not an experienced mechanic so I did not want to do stuff which will cause more trouble etc. As a Christian, it is awesome to see how God takes an active part in my life in such a simple and practical way! Oh. I think I am about the sixth owner. 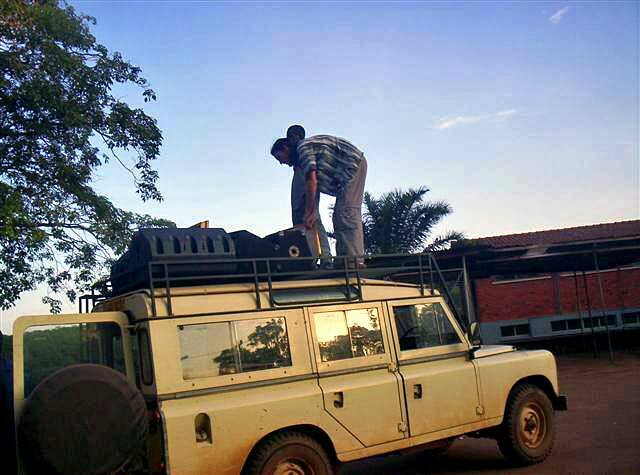 Abe was imported from UK to Malawi by UK gov. guys back then (1984 / 85) and made a turn in Kenya before it came to us in Uganda. Well. I followed your advice and it was exactly like you predicted. The Nylon thing disintegrated and I was left with the metal. It managed to slip out between the 4th/3rd and 1st/2nd and the gear lever was was just hanging loose. 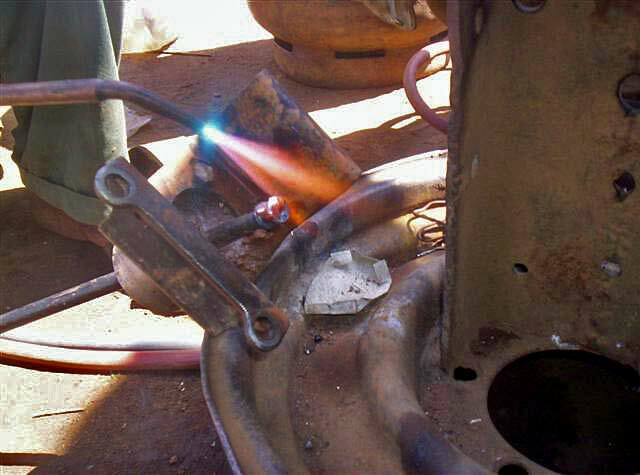 It cost only a bit of time from my side, and two very small expenses: A number 11 spanner because mine vanished mysteriously and the actual brazing. Oh. And I bought a sharp mouth pliers and a normal one. The total budget was about 12 000 UGS or basically, $6! will appreciate it if there is an answer for them. have never checked the oil for the overdrive. Thanks for the advice. Better check it tomorrow. I am going to sleep. Copyright Dixon Kenner, 1995-2011. Last modified February 25, 2009.